4 What Do White Breasted Nuthatches Eat? Although common at feeders, the white-breasted nuthatch has some unique characteristics that make it an especially interesting backyard bird. White-breasted nuthatches are agile and acrobatic, with a distinctive black head stripe, white breast, and gray-blue back. 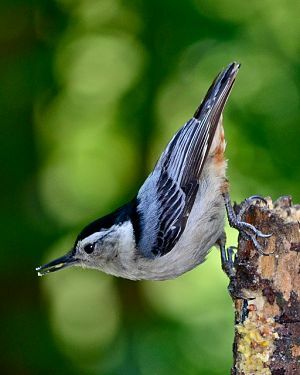 Despite being the largest of all the nuthatches, the white-breasted nuthatch is still a small bird, roughly fist-sized and typically weighing less than an ounce. They have a wingspan around 11 inches and feed mostly on insects and large, meaty seeds. Although easily identifiable anywhere in the U.S., they have three specific population regions – Eastern, Interior West, and Pacific – and each population differs slightly in plumage, shape, and song. Even with the slight variations in appearance according to the population region, the white-breasted nuthatch can reliably be identified by its nasal, soft whistle in every region. You can listen to the sound of the white-breasted nuthatch call song here. With a habitat range spanning almost the entire U.S., the white-breasted nuthatch isn’t hard to spot. These birds typically prefer mature, deciduous forests composed of hickory, basswood, and oak, but have been known to nest in conifers as well. Trees in various stages of decay are particularly important habitats for breeding nuthatches. Compared to other birds, nuthatches have unique movement capabilities. You’ll find them face down, feet pointing toward the ground, and hopping sideways over trunks and thick branches of mature woods and along forest edges. This is the easiest way to identify nuthatches. Scientists speculate that traveling upside down – similarly to squirrels – makes it easier for the nuthatch to spot insects that upright birds might otherwise miss. What Do White Breasted Nuthatches Eat? What really makes the white-breasted nuthatch unique though, is its habit of caching, or saving food for later. Nuthatches will typically hide seeds away in loose bark, lichen, moss, snow, and other nooks and crannies, saving up for winter food shortages. Because of this, white-breasted nuthatches don’t have to migrate in winter like the red-breasted nuthatch, or significantly lower their body temperatures, like the pygmy nuthatch. Instead, the white-breasted nuthatch stays local to its usual territories and eats the food it saved. For extra warmth, they often keep to small, mixed flocks with other nuthatches, chickadees, and titmice during the colder months. A small flock also makes predators easier to spot and food simpler to find. Nuthatches are known to stick with one mate through the entire season, so if you spot one, chances are its mate is nearby. However, male nuthatches become especially aggressive during the winter months. It’s not uncommon for nuthatches to raid each other’s caches, which drives the males toward exceptionally defensive behavior. The males go to battle defending their seed collections and even their mates are barred from accessing the cache. In fact, the males get so paranoid about their food stores that they will often fly away from feeders in erratic directions so as not to lead others to their stash. This makes winter an especially compelling time to watch for the white-breasted nuthatch. With their sharp, straight beaks, these birds will break open – or “hatch” – the seeds they stored, giving them their name. Using various hard surfaces like trees and rocks, the nuthatch whacks seeds apart to get to the soft meat inside. 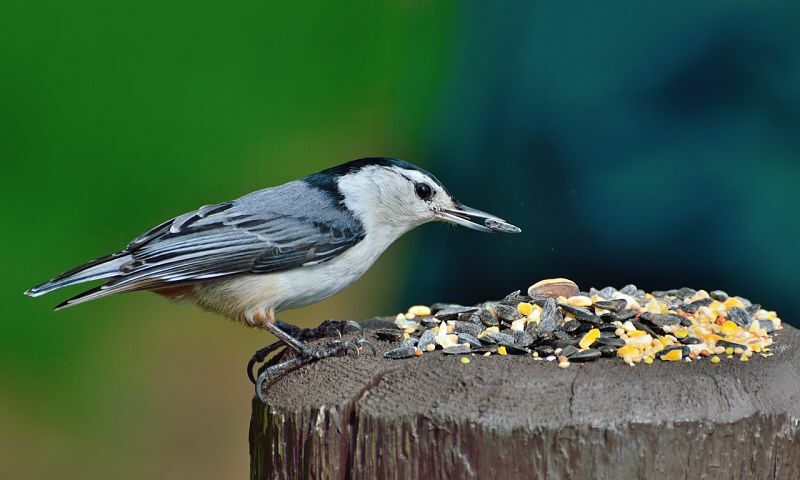 You can attract nuthatches to your yard by putting out large seeds like sunflowers and peanuts, or suet and peanut butter. They don’t show much fear of humans and have been known to eat directly out of people’s hands. Despite their commonality in North America, very little is known about the biology of white-breasted nuthatches, especially during breeding, as their nests are difficult to find and examine. What scientists do know is that the white-breasted nuthatch is incredibly important to the deciduous forest ecosystem. Although known mainly for their love of seeds, these birds also feast on gypsy moths, tent caterpillars, and other destructive insects. Spring is when courtship begins. The males suspend their normal food-centered aggression and cater to the females as they enter into breeding season. Despite dominating the females all winter at the feeders, throughout spring the males will often place seeds directly into their mate’s beak. They’ve even been known to cache seeds for the females in a courtship display. Nesting usually begins in mid-April and is well underway by May. Nuthatches build their nests high up in trees, seeking out natural cavities, woodpecker holes, or other knots and hideouts. Dead or decaying trees are especially important for nesting nuthatches and too much pruning or removal of dead wood can lead to nuthatch decline. The females do all of the nest building, starting with bark, clumps of dirt, and fur. Every kind of fur from cow, to fox, to squirrel has been found in nuthatch nests. The female then creates a small cup of delicate grasses, feathers, and other fine material on top for the final clutch of eggs. The breeding pair will often reuse the same cubbyhole for nesting multiple seasons. Typically, the females incubate five to nine eggs, but have been known to have as many as 12. The nesting period is around 26 days before their featherless babies hatch. Over the last 40 years, the white-breasted nuthatch has had significant population growth and is considered of least concern with more than 9.2 million breeding pairs in North America. Hey Buddy!, I found this information for you: "The White-Breasted Nuthatch Bird". Here is the website link: http://backyardbirdingblog.com/white-breasted-nuthatch-bird/. Thank you.